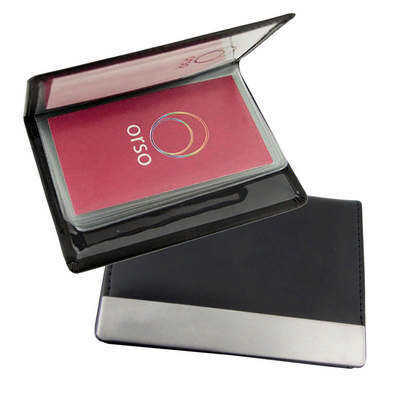 Faux Leather buinsess card holder. Stainless steel branding badge. Holds up to 15 cards. 8 sleeves. Boxed. Product Size: 117 x 75 x 8mm. Product Packing: Boxed. Decoration Size: 50 x 10mm. Decoration Position: Front of business card holder. Decoration Method: Pad Print | Laser Printing. Carton Quantities: 100. Carton Size: 45 x 21 x 31. Carton Weight: 8. Colour: Black/Silver. Price includes: See drop down menu for decoration options.